Even before I met my Southern Italian man, I’ve been madly in love with Biscotti. There’s something about biting into its hard exterior and then being met with a soft, crumbly inner which makes me happy. Oh so happy. Feeling all cocky, I first tried making my own Biscotti about three years ago and failed dismally. The rolls bent my knife when I tried slicing into them for the second bake. And when I finally managed to cut a slice without it crumbling to bits before my very eyes, it sent me into a fit of hacking coughs. Yes, it was that dry. We’ve been through the ringer, Biscotti and I, and I’m proud to say that the Italian dessert no longer has me beat 🙂 try this Ginger Nutmeg Biscotti recipe (is it not perfect for Fall?) and let me know if your adventures with Biscotti were as dramatic as mine. Preheat the oven to 350 degrees F. We’re using the centre rack. Lightly spritz a baking sheet with nonstick spray and set aside. This is the one and only time I use the spray because butter would make the batter runny and spread out. Combine ingredients listed in Mix A in a large bowl. In a separate, smaller bowl, combine Mix B until thoroughly integrated and a fairly dry dough appears. Divide into three. On a lightly floured surface (make sure your hands are lightly floured too, just lightly otherwise the excess flour will work into the dough as you shape it and harden it), shape each portion of the dough into a log about 1 1/2″ wide by 1″ tall. The length should be between 8 to 9″. Transfer the logs to the pre-prepped baking sheet and place them in the centre, about 1 1/2″ apart. Bake for about 20 minutes or when the logs are firm to the touch and an inserted toothpick comes out clean. Let logs cool for around 15 minutes. Then with a serrated knife, cut them crosswise into 1/2 inch slices. Place Biscotti back onto tray and bake for no more than 5 minutes on each side, at 300 degrees F. You can check ever so often to ensure they’re not browning. 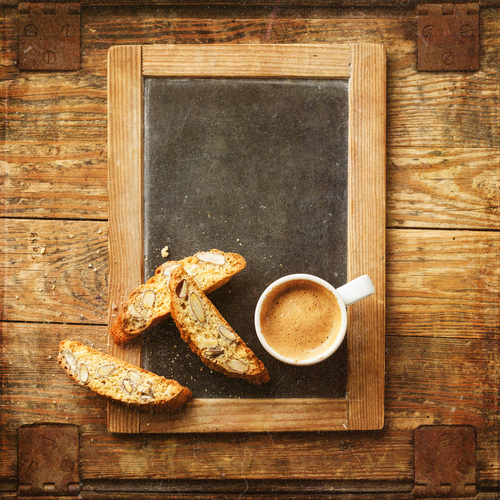 Let cooked Biscotti stand for an additional 10 minutes prior to serving (Lavazza Qualita Oro coffee optional but highly recommended for those craving the bells and whistles). Biscotti will crisp as it cools. Pinkie promise.